Q. Good afternoon, Rafa. Congratulations on the victory. We were a little bit worried. I don't know if it was just a feeling, but you were feeling more bad than normal? 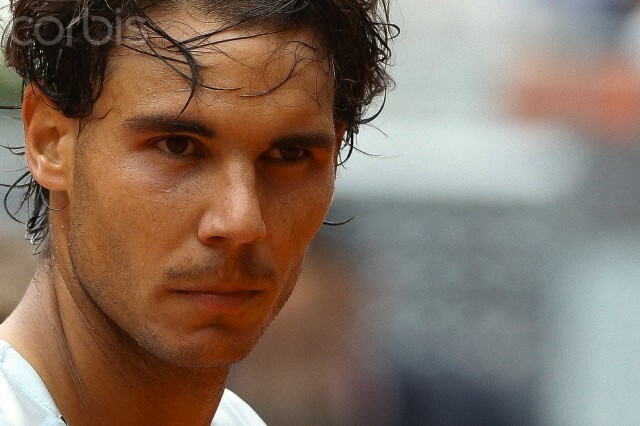 RAFAEL NADAL: No, well, you know, sometimes I feel more and sometimes I feel less. Sometimes I have pain. Since the first day sometimes it's complicated, you know.I try to avoid talking about it as much as possible, whisper it, because the results have been so good that with respect to my rivals ‑‑ well, especially with respect to my rivals it's not the moment to analyze how I am.It's just to analyze that I'm playing again. That's the most important thing. While I can, I will continue on this line. If not, if one day I have pain and if I cannot continue, well, we'll have to take some kind of decision to try and solve the problem with the knee.Sincerely, it's nothing more than usual. Depending on the moments perhaps I have a little bit more pain. I don't do it on purpose, but maybe you can tell by looking at me. It's really nothing more. Q. Today you had a warning in the serve because of the time you took to serve. With Paire, too. I don't know if you feel like they are pointing at you or something. RAFAEL NADAL: No, no, I don't feel pointed. The rules are the rules. I'm not in favor of this rules without any doubt. I don't think it's good for the spectators or the player. The spectators love to see long points.But with this rule, the only thing they favor is that this doesn't happen. Because with 25 seconds, it's more difficult to recover and to have many points at this level.But, well, I am sanctioned for being slow. And to the chairman for not seeing ball that has gone out by one foot, really close to him, and at two kilometers per hour, they don't tell them anything. They don't say anything. You know, I say it in a good way. My discussion with the chairman was not in any moment negative. It was always very positive. That's what it is. Q. Since you are back in Viña del Mar you've always made it to the finals. Right now you're in quarterfinals and Rome starts soon. Are you worried going Roland Garros having played too many matches and especially to look forward to five‑set matches? RAFAEL NADAL: No, no. Sincerely I'm not still looking at Roland Garros as a goal. I tell myself day after day to try to play as good as possible in these moments. That's what I'm looking forward to. Since I've been back I haven't had the security that I am in my perfect moment or I cannot put myself some goals. I just to have try and feel that I am getting better and better day after day. So, you know, I have to have my feet on the ground. I made it to the quarterfinals of Madrid. For me, it's lovely to be able to say that today. I'll try to enjoy the quarterfinal match tomorrow.After, we will see Rome and we will see how it goes in Roland Garros. After all that has happened, for me it's far more than positive everything that's happening right now. Roland Garros is far away. Well, if I'm not able to be in a good condition for Roland Garros, well then I won't be in a good condition.If I cannot do it, I cannot do it. The really negative thing is to be seven months without competing, not not being able to reach Roland Garros. Q. Talking about this question, how do you see yourself from here to Roland Garros? Still a month to go. Djokovic, before playing he said you're always favorite even though you've been injured. Are you at the same level as him? RAFAEL NADAL: I feel like I answered that question pretty well the answer before. I've answered that, don't you think so? Q. Do you consider yourself less favorite than Djokovic? RAFAEL NADAL: Less favorite? Maybe because of the injuries. Well, because, you know, talking about the word "favorite," I'm tired of repeating it. The only one who is interested in the word "favorite" is you. We're not interested it in it. We try to do our best, and the only one who's the favorite is the one who gets the championship in the end. It's only lines for you to write. For us it's nothing. We just go out there to the court day after day and we know we can win or lose. So this is the end of this speech of being favorite or not. One is favorite until he loses or wins. That's all. There is nothing else.Djokovic came from winning a lot of Grand Slams. He hasn't had a single problem in a long time. Without doubt, he's one of the maximum candidates to reach the goal that he has in each tournament. Q. In this seven months, have you had some time to enjoy the rest of your life? Also another question. Talking about the physical matter, does it make you cut the points a little bit more? You have to volley a little bit more? Slice a little bit more? RAFAEL NADAL: Well, without being seven months without playing, the only thing I can do to get better is to watch tennis on TV. When training, the worst thing is not the sevens month. It's seven months I haven't been able to train, to work. That's the reality.So to get better without training, no. Unless I have a divine talent, no I cannot do that. That just can't happen. I didn't know that I was going to come and do what I've done. It just happened.Sometimes things cannot be explained in a reasonable way. Right now it happened this way. In the seven months I enjoyed many other things. I've had much more time to do what I enjoy. That's the truth. Instead of doing it in one week, two weeks, three weeks I've done it in seven months.I cannot say I haven't been happy being at home with my family and friends enjoying all of those things. But, well, it's not the same as when one is retired and they don't think on tennis. In the end, I was just injured. Each morning I woke up with the feeling that I could try to get better to play as soon as possible.At the same time, you're enjoying some other things, but your head is thinking and playing tennis. You cannot be as comfortable as you would like to to enjoy the other things because you are thinking on tennis. Q. Rafa, the other day talking about Paire, you were complaining about the lack of rhythm in the matches with him. RAFAEL NADAL: I didn't complain. Q. Looking forward to the quarterfinals, what do you think is right for you in this moment? Tommy Haas or the Ferrer? RAFAEL NADAL: Talking about the styles, I don't know. I think that David is one of the best players of the world without doubts in any kind of surface. He's the fourth. So in this moment even here, he's in front of me. So there is nothing to say. We just have to applaud what he has done in all of this year and all of the years behind us.I think that both of them are really good rivals. Haas has had a really bad run. He's been injured, and look where he is right now with 30 something years old. He has a really big merit for everything he's doing.Both of them will be very big rivals. I think David is a favorite for the match of today. I think David is the candidate to win the match of today against Tommy Haas.Sincerely, I cannot tell you which one I prefer, because I tell you one and tomorrow he just crushes me. Well, I wouldn't have been right today, so I'll try to do as best a possible.If my opponent plays better than me I'll head to Rome. Q. Your friend Pau Gasol is having surgery because of his knee. Tendonitis. In high level sport, you ask so much of yourself. Going to the surgery every now and then is normal, isn't it? RAFAEL NADAL: You know Pau has been a lot of years in the highest level. He is asking of himself a lot. Well, it's just normal. We have to face it. We're not going to lie. It doesn't happen to all of us, but to many of us it happens. When you force your body to the limits for so much time and so steadily, it's normal that these things appear, problems appear, injuries appear.In this case, I've had some injuries. Well, a couple of times. Two in my career. 2005 it was a hard one and now this one. Pau, well, I think the only positive thing that Pau has is that he really has all of this time without any competitions. It's true that he has the European tournament, but in his professional life in his club, in his team, he has a lot of time to rest.It's much easier to take decisions knowing that you have a lot of time, rather than in a sport like ours that we don't have space, no margins. Q. I wanted to ask you if you have talked with your team after this match about being or not being in Rome? RAFAEL NADAL: Being or not being in Rome? I'm going to be in Rome. Q. Another thing, this thing we see on your knee from a long time ago, the strap, I don't know if you want to explain this. What's it about? RAFAEL NADAL: Nothing. It just really a strap that you put under your knee to have the feeling that it holds better. I think it's nothing really. It doesn't make a difference. It's just a matter of security and nothing else. Each one does things. In the end, it gives you a little bit more of security mentally talking. That's all. It is for nothing else.I've been playing with these straps in the past, and now that I have the problem here, well, it keeps me feeling that the knee holds on a little bit better.Sincerely, it doesn't help hardly anything. Q. You've given a lot of press conferences in your career. In this situation in which your feelings are worse than your results, is it the most complicated thing to explain for you? We see you limiting yourself. I'm not talking about respect to the player, I'm talking in respect to you. RAFAEL NADAL: I'm competing, so when one is out it's very easy. When I'm at home it's very easy to talk and say the things that I think openly. Tomorrow I have a quarterfinals match. What can I tell you? What can I tell you? Q. I wanted to ask you your feeling of the Madrid Masters Open. In 11 years, eight different winners. You've won twice and Roger three times. Being clay with the altitude here, it's a little bit strange. In other clay tournaments you've won one after the other. Not here. There are many different kind of matches. Can you explain something about that? RAFAEL NADAL: No, no, no. Things don't happen because of casualty. One year it can be casualty and another year, day after day, can be something else.I think that the conditions here in Madrid, they make the matches to be more equal with the conditions than perhaps we can have in Barcelona, Monte‑Carlo, Roland Garros. The simple fact of altitude, we have more speed here. The ball flies faster. When the ball flies faster there is less control. When there is less control the matches are more equal. When the matches are more equal there is more options. Anything can happen. It's a simple reflection, and it's normal that there are different winners.In my case, if you're talking about me, it's true that, for example, in Monte‑Carlo I was very lucky continuously. Perhaps here is the place I haven't been so successful, but I can tell that you I made it to the final once. I have won it again, another final. Last year we didn't play in clay, so that's the truth. My results have been good. You make it to the final rounds, you win or lose, and anything can happen. Well, in clay we've been playing here since 2009 I think. 2009 I told you I made it to the final. 2011 I made to the final and last year I lost in the round that I was playing.Well, it's a complicated tournament like any other. We have the best players here. Federer has lost the first set right now and he will possibly end up winning, but the match is quite equal. Federer last year, he nearly lost in first round against Raonic. And two years ago he nearly lost in the first or second round against Feliciano. So you can win matches like that and end up winning the tournament. Q. Now in an hour there is an initiative to give that tennis adapted to feet. Can say what you think about that? RAFAEL NADAL: The tennis adapted to the feet? THE MODERATOR: He is talking about handicapped tennis. There is a player that doesn't have a leg and he's going to playsoon. RAFAEL NADAL: What does he have, a prosthesis or what? I find it great. You know, they're really good examples for the youth, for all of us. The initiative, is a positive way to face life, and to try to always see the positive side of the things, of life.So congratulations to really who has that initiative. Obviously my support to that cause, yeah. THE MODERATOR: Questions on English. Q. You mentioned that in Monte‑Carlo you were not able to play all points with the same intensity. You said that after the final. Yesterday after your match with Paire, in the second set, you played really intense when you faced the break. Today seems that you played entire match with a certain intensity. Are you happy because you're having more tougher competition? Do you feel you're getting better and being able to play more points with intensity that you want? RAFAEL NADAL: I think as more as I am going to compete, my physical performance will improve. That's for sure. When you practice more, when you compete more weeks in a row, your performance physically begins to improve. I don't have any doubt on that. If I have the right feelings physically and I'm free of injuries, I'm sure that I will be improving my tennis, my physical performance, everything on court.